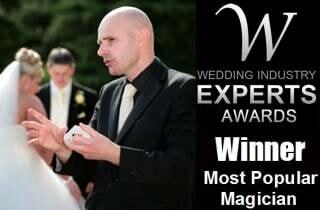 For weddings in Peterborough, David Fox is the first choice magician for many brides and grooms on their special day. Peterborough party organisers book David to ensure their events are great successes. Magic perfect for all occasions! Companies throughout Peterborough and its environs choose David to perform at important corporate events. 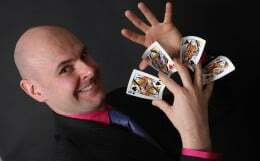 Why not witness the sensational magic of Peterborough master of illusion David fox? David Fox's marvellous magical skills will bring amazement to any party, wedding reception or corporate event in Peterborough. David has been performing magic in restaurants, hotels, clubs, schools and football grounds for the past decade and is a dedicated and professional performer. David Fox is a member of the world famous Magic Circle organisation and many large companies often invite him to perform at their special events. Capital One, Experian and Jurys Inn are but three of a long list of satisfied corporate clients. Please view the 'Testimonials' section of the website and discover how David Fox has enhanced many important events over the years with his magic. Planning a special function in Peterborough? Contact David Fox now for details. David recently amazed everyone at the launch of the new Mini at Sytner BMW Sycamore Peterborough on Papyrus Road. A sensational show of illusion heralded the unveiling of the new car. Mr Fox then mingled among the VIP guests performing slick sleight-of-hand and a cavalcade of entertaining effects. Each year Peterborough hosts the incredible Truckfest event at Peterborough Arena and East of England Showground. This year, David performed magic at the stall of Towergate Insurance. His remit was to attract potential clients to the company and his colourful performance of prestidigitation received resounding feedback. Indeed, this just highlights how David Fox's wonderful magic is ideal for any occasion and he can customise packages for all types of scenarios!